For decades manufacturers and artists have tried to capture the essence of nature to put it into products for consumers' enjoyment. Paintings of bolts of lightening or the wonders of outer space, candles with the aroma of ocean waves or tropical jungle mists, sound machines depicting a bubbling stream or the croak of a bullfrog, and more. But what about the taste of nature — in particular a sunrise? We can close our eyes and imagine the beautiful colors, hear the early morning crickets or even smell the warming of the dew on the grass, but taste? How what sort of flavor would that early morning scene provide? 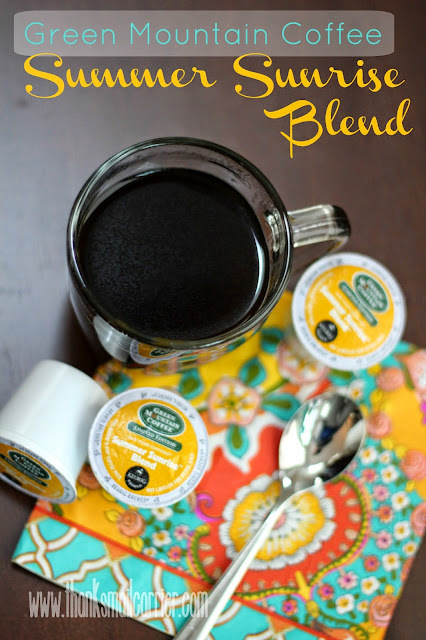 There's no doubt in my mind that Green Mountain Coffee has accomplished it spot on with their Green Mountain Summer Sunrise Blend limited edition K-cup coffee! 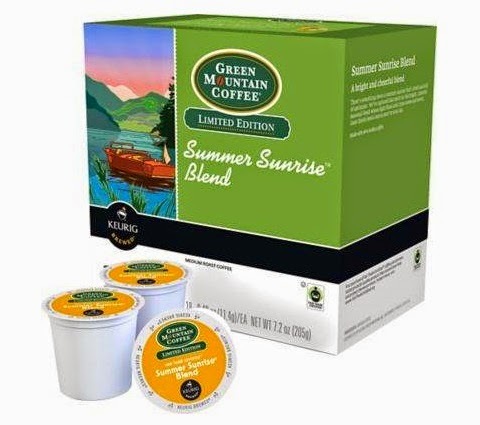 A limited edition, fair trade certified coffee, Green Mountain Summer Sunrise Blend is a seasonal roast that only makes an appearance in late spring. We all know the feeling of fresh, bright sunshine to start the day, so why not embrace the same cheerful warmth in our favorite mug? I was intrigued to try Summer Sunrise Blend simply after hearing the name, but then when I saw that it is medium roast, is made from 100% Arabica beans, and that it contains citrus notes and provides a sweet, clean finish, I was even more excited to start brewing. I'm the first to admit that I'm not always the most cheery person in the morning, so taking a deep breath of this aromatic, seasonal blend has been a great way to make me feel a little more sunny. I love that Green Mountain Coffee created this special coffee to reflect the best aspect of the season and that the essence of summer is found in each sip! Mmm, mmmm! Full-bodied, medium roast, rich aroma, and a smooth, almost-creamy flavor with the tiniest hint of sweetness? I really couldn't ask for much more and am looking forward to waking up to these K-cups for as long as they are available! If you're already a fan of Green Mountain Coffee (who isn't? 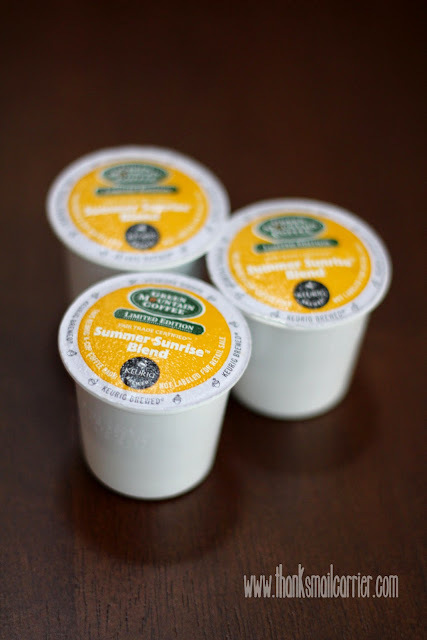 ), make sure to pick up some Summer Sunrise Blend delectable K-cup coffee (head over to the fabulous Cross Country Cafe for a great deal!) for easy and delicious brewing in your Keurig. I'm telling you, it's like a slice of uplifting sunshine right in your mug every morning! I like the concept of this coffee, but I just don't like coffee of any kind.